Hold the fireworks, Fox. Your attempt to move the 4th of July up a week may have exploded in your face, like a certain iconic Washington D.C. structure. 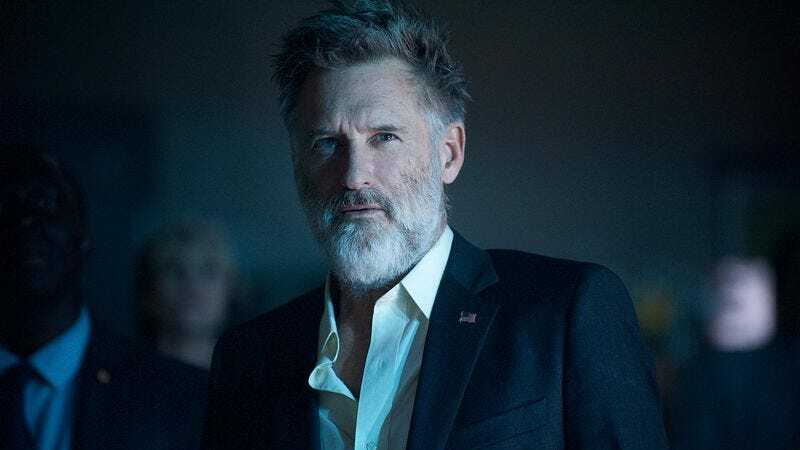 Independence Day: Resurgence, Roland Emmerich’s belated sequel to his seminal summer tentpole, opened on Friday, a full 10 days ahead of the holiday for which it’s named. But rather than capitalizing on the absence of a Transformers movie in that prime summer real estate, the film debuted to only $41.6 million—less, in other words, than what the original made in its first weekend, a full 20 years ago. Tickets were cheaper back then, you may remember. For one thing, there was no option to pay extra for some plastic glasses that give you a headache and make everything look a little like a classroom diorama. Was it bad reviews that shot down Emmerich’s blockbuster? Did the absence of Will Smith welcoming an alien to Earth (not “Earf,” racists) result in the box-office equivalent of crashing a fighter jet into the film’s glowing laser cannon? Or did everyone just catch wind of the fact that the movie is yet another big-budget advertisement for more sequels (which probably won’t arrive at this point)? $41.6 million wouldn’t look so disastrous if the movie hadn’t cost $165 million before marketing. At this point, Fox is hoping they have a Warcraft on their hands, and that Resurgence will make up for its underwhelming domestic haul with a big international victory. With an estimated $101.4 million already in global ticket sales, the battle isn’t lost—though there’s some irony in the success of an ID4 sequel resting on non-American patronage. Who knows, though? Maybe Americans will come out in droves this actual holiday weekend. Or maybe they’ll just see Finding Dory again. After shattering the record for best animated opening a week ago, the mega-hit added another $73.2 million, easily besting Resurgence to land in first place again. With $286 million, it’s already Pixar’s fifth highest grosser, and will probably at this rate catch up to the original Finding Nemo. If it catches Toy Story 3, it’ll also be the biggest hit of the year, though that’s still more than a $100 million off. Speaking of profitable underwater attractions, the Blake Lively shark thriller The Shallows landed in fourth place, right behind Central Intelligence, with $16.7 million—a hell of a haul for a movie that only cost $17 million. That’s also more than twice as much as Free State Of Jones could manage; the McConaughey-led Civil War drama grossed just $7.7 milllion, crushing dreams of an adult-oriented hit in a summer of sequels, though the fact that it’s apparently not very good couldn’t have helped. But the big loser of the weekend was probably The Neon Demon, which made just $606,000 on more than 700 screens. The weekend of weird played out better for Swiss Army Man, whose $114,000 intake on just three screens indicates that readymade cult movies do better when rolled out slowly, rather than thrown headlong into the deep waters of the summer movie season.